$160.00 Out of stock. Email me when new stock arrives. 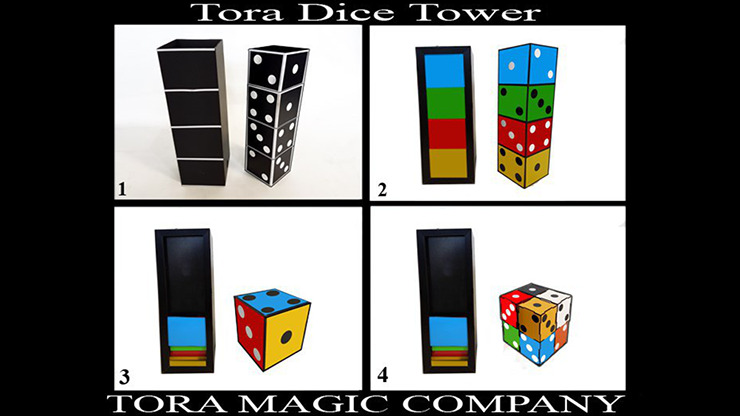 If you need a stage effect that transcends language barriers while becoming progressively more impossible, then take a look at Tora Dice Tower! Four stacked black dice get covered with and empty tube. However, when a colored cover is put on the front and the cover removed, the dice now match the colors on the front of the tube! But the fun's not over yet. When all four colored squares on the tube are moved to the bottom to show only one yellow square, a quick cover and removal of the tube leaves behind just one yellow die. Covered once again, the yellow square is bisected by two black lines. Now when the cover is removed, the yellow die has been dissected into eight smaller dice, yet the tube can still be shown empty! Get yours and start astounding and perplexing your audiences today!